Have you ever imagined a life without parties? A life where you don't get to unwind and release your tensed up muscles? A life of just sitting in the house during weekends? Well, I'v imagined that life, and trust me it sends a terrible chill down my spine. Everybody loves to party, a popular hip hop/ R & B singer wasn't wrong in his major club banger song when he said " We love to party!!!" So today I decided to throw some light on a typical Owanbe situation. You see, the inspirations for Owanbe parties are usually drawn from everyday circumstances, the birth of a newborn, the death of aged family members, wedding ceremonies and birthday celebrations. Well other circumstances can be accommodated, but basically Owanbe parties revolve around the outlined circumstances. The very first step is choosing a date for the party, after which organizers set out to choose ankara or lace materials that would be sold to intending attendees. And trust me, this is one of my favorite part, because at the party you get to see so many amazing designs and how creative the Nigerian fashion industry is becoming. Skip to the D-day, its always a beautiful day. An array of bright colors and a thronging mass of bodies pulsating with positive energy and a honest purpose of doing just one thing, have FUN!!!. Now to the part you all must have been anticipating, "The food"!!!. There's always an array of delicacies, fried rice, amala, porridge, beans and plantain, moi moi and the most important one of them all: The Jollof Rice. If you ask me, what makes an Owanbe party is the jollof rice, if the jollof rice has failed, then the party may not have the intended after tales. Of course the rice and other delicacies are often served alongside beef, turkey and fish, however its quite annoying that in some worst case scenarios, the beef is always unnecessarily tough. My granny had once told me of a friend who organized Owanbe functions and served tough beefs, attendees often struggled with the beef and eventually dumped it on their plates. Well here's the weird part, the woman, after the party, picks up all the left over pieces of beef that have been chewed on and spat on, washes them, re-fries and yes, she cooks them. Apparently its no mistake that the beef wasn't properly tenderized , she always had other intentions. Well, I just had to quickly chip that in, for everyone reading this, if you are guilty of this horrid party mishap, please, please and please it is very ungodly!!! Its not nice to have your beautifully dressed attendees struggling with tough chunks of beefs...yes!, its always a terrible scene to experience. You all must be wondering if I have forgotten the souvenirs, hell no! How could I? That would be unforgivable. You know, I'v come to realize that Owanbe parties have no souvenir restrictions! My mum once came home with light bulbs. The souvenirs often come in two parts, there's always the one that comes with buying the ankara or lace material of the party, and there's the one that friends and family often give out. Handkerchiefs, soaps, plastic cups and bowls, biros, food flasks, hand fans, cooking pots, jotters, cutlery sets...the list of items that make the cut goes on and on. A very annoying trend however, is the eye service that is often exhibited when the souvenirs are handed out. Just in case you are wondering what an eye service is, well, its simply a selection process based on your affinity with the other person. In a very embarrassing situation for me, I had stretched out my hands to collect a cutlery set that was being passed around, and the woman looked at me in the most ridiculous manner and passed me by...yes! It was real awkward for me. Oh, I have not forgotten about the dance routine. Now I'm not talking about the electric slide, the moon walk, the chest pop and the lean back. I'm talking about the original konko below dance style or what you may call the Komole dance style. Well, its quite a sight for the eyes, the celebrant is often ushered to the stage and that's when you see the clinchers trailing behind the celebrant, of course there's always a hidden motive. You must have noticed those individuals that are tirelessly picking up the naira notes that are being sprayed on the celebrant..they are the clinchers. And finally, there's the last group of individuals, they are often oddly dressed. There's always a sharp contrast between their choice of outfits and what others are putting on, but they have mastered the art of blending in. In fact, they can render the profile of the celebrant or deceased without mincing words. You can see the fake mary kay powders waring off their faces after being soiled with the grease from turkeys, and for the guys, you see them ordering the waiters and waitresses around, asking for more bottles of alcohol and more plates of food. Well, they are no other than the gate crashers, or what may be otherwise known as the "Mogbo Moyas". 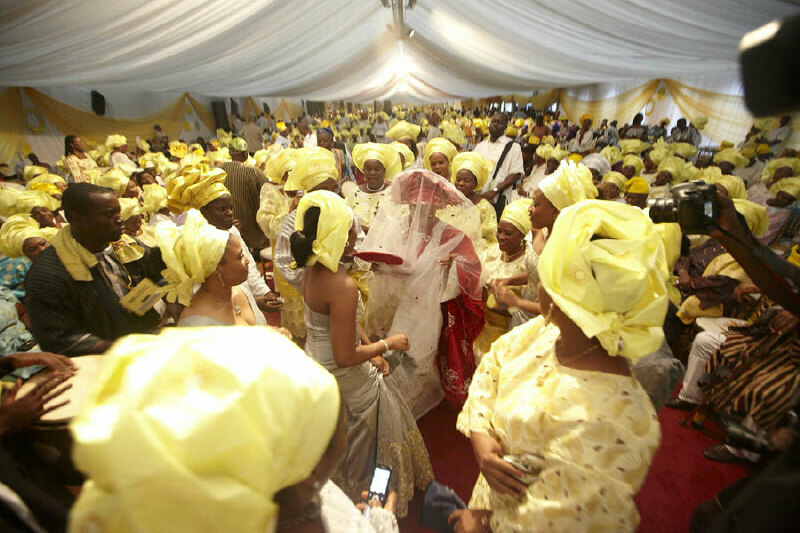 They are a vital part of the Owanbe process, they are the life of the party. Always have a big brown bag for souvenirs!